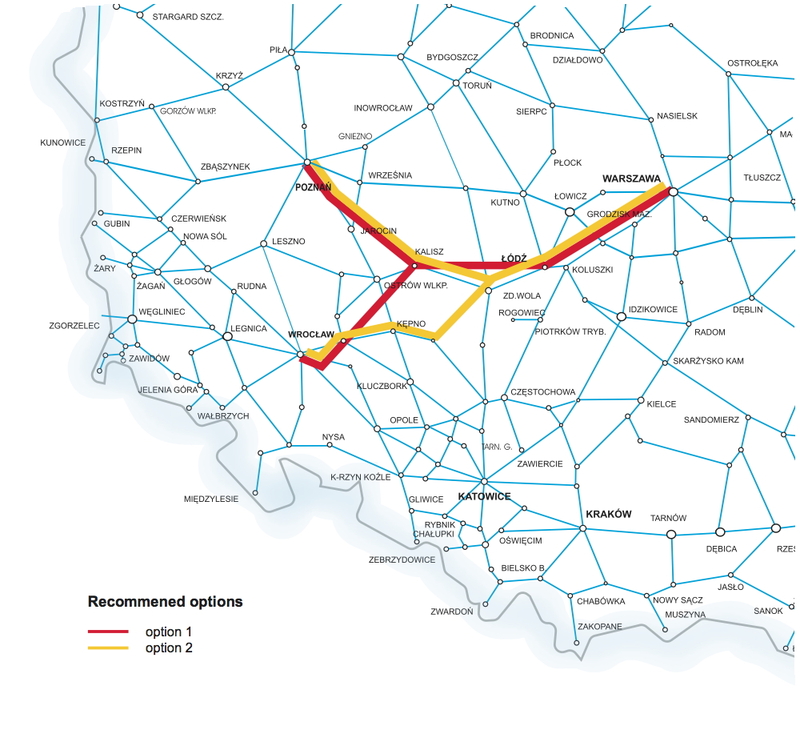 High Speed Line Route Options. Map courtesy PKP PLK. No statement in the Sejm (the lower house of Poland’s Parliament), no notice on the Ministry’s website, no official press release; only a brief mention at the end of a press conference about the way Poland’s railways were planning to cope with the winter – that was the way new transport minister, Slawomir Nowak, announced the suspension of the project to build Poland’s first dedicated high speed railway line, the Kolej Duzych Predkości (KDP). The Y-shaped line from Warszawa through Lodz with a northern branch to Poznan and a southern branch to Wroclaw would have been 450 to 470 km long and designed for 350 km/h running. The Minister said that it was more important to focus on bringing the existing network up to scratch than spend money on new fancy new projects. For many years, railway workers have dreamed of building high speed railways. Their cost could be 20bn zloty, or even 28bn zloty, [unofficial estimates price the “Y” lines at 35bn PLN, D] that’s why I have decided to suspend work on the project until after 2030. First we must concentrate on repairing the railway tracks that already exist, only then can we spend money on new projects. After our modernization works are complete trains will able to reach some 200-220 km/h [125 – 140mph]. That can already be described as ‘high speed’. The Minister added, If you have a Syrenka, you can dream of owning a Bentley, but first it’s better to buy a Golf. This entry was posted on Saturday, 10 December 2011 at 21:57 and is filed under KDP. You can follow any responses to this entry through the RSS 2.0 feed. You can leave a response, or trackback from your own site.